If you you're in power and sure you have the majority of votes in your country, there is no need to rig elections. If you still do, your attempts could only backfire (Unless of course when you're not satisfied with simply the majority and you need a 2/3 majority in congress to be able to rewrite the constitution, as has happened in the 2011 Nicaragua elections). Hugo Chávez strengthened the electoral system considerably by introducing voting machines, better laws and procedures. Never the less he still succeeded to rig the results of the intensively negotiated 2004 recall referendum. At the time the exit polls already showed that there was a massive electoral fraud going on. Strong statistical proof according to two different methods (Benford's Law and Cluster Analysis) came available years later, when the National Electoral Council (CNE), foreign observers and OAS countries had already accepted the results. Chávez rigged the 2010 Venezuelan parliamentary elections by applying pre-election fraud referred to as gerrymandering as you can read below. Now facing a close finish with Henrique Capriles in the 2012 presidential elections, Chávez' rigging needs to be even more sophisticated than in 2004 and 2010. Check out the rest of this blogpost to find out about these methods. It's obvious to me that Chávez wanted to show the World that Venezuela is able to have free and fair elections under the Chávez administration. The most important reasons are that Chávez is still afraid for some US supported coup (as happened before) and that he wants the World to take his Bolivarian Socialism seriously. So Chávez' aim was to mobilize his own electorate to the max. and divert his strategy to pre-election fraud. It has become very difficult anyway for Chávez to rig the elections results itself without being caught red handed. He knows that solid well-conducted exit polls will be held and that the elections results will probably be checked instantly against Benford's Law and other statistical tests. The way to go for Chávez is primarily to focus on mobilizing his electorate, which in itself is a good thing. He has done that by further reduction of exclusion of voters living in rural areas in the electoral roll to approx. 3.5% (which was approx. 20% in 1998) and by further increasing the number of voting booths and polling centers in rural areas and in poor uphill city neighborhoods. The 2012 presidential elections will be held with 38,266 voting booths and 14,055 polling centers. Applying pre-election fraud is another successful strategy, because you can get away with it in most cases. Nicaragua has been a playground for Venezuelan advisers to apply pre-election fraud in the past. Gerrymandering. The term was coined in 1812 in Massachusetts and even the United States has a long tradition of gerrymandering that began just before the 1789 election of the First U.S. Congress. Still after the US 2004 Congressional elections, International election observers expressed criticism of the preceding redistricting process. Gerrymandering is the reorganization of election districts in favor of a political party, in this case of Chávez' PSUV just before the 2010 parliamentary elections. Under the new law, in 2009, electoral districts were redefined in a way that has been accused of favoring the PSUV, particularly in giving more weight to votes in the countryside over those in the city. It gave disproportionate power to rural districts where the opposition remains weak. The effect of the redistricting was phenomenal. Chávez' PSUV won 98 seats with 48.2 % of the votes, MUD had 47.17% of the votes, but only good for 65 out of the 165 seats of the Venezuelan parliament. 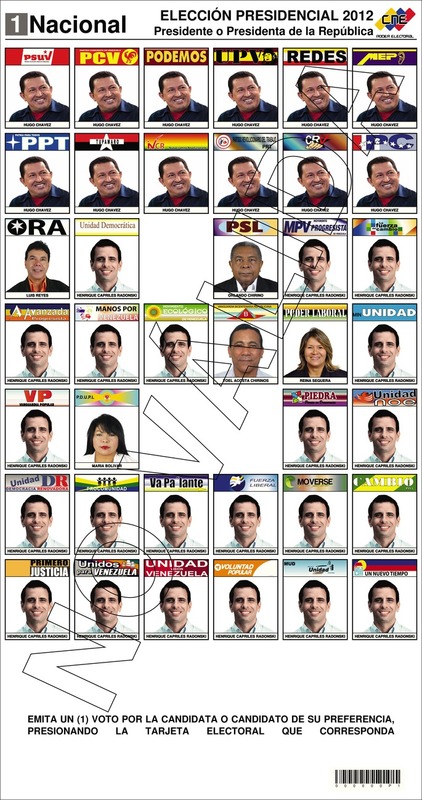 Of course this redefinition of electoral districts won't affect the 2012 presidential elections directly, but if MUD's Capriles wins the presidential elections, he will still have a minority in Parliament for at least until 2015 and beyond, unless he redefines electoral districts again. Campaign Funding. Chávez is using massive public funds for his campaign. Chavez' face smiles down from innumerable billboards and signs festooned on lampposts throughout Caracas and other cities. Besides, numerous civil servants and PDVSA employees are working for Chávez' campaign during working hours, using their working equipment. Capriles has to finance his with small private funds. The law gives the CNE "the power to determine and regulate all matters relating to the financing of election campaigns" and to "ensure compliance with the provisions of law relating to the origination and management of funding of political organizations", but the CNE is turning a blind eye. Media Advantage. Chávez has unlimited access to television time on state-owned television and radio stations. Capriles is only entitled to three minutes of television ads a day and some free airtime on Globovísión, the last remaining critical TV station. Chávez is using his power as president regularly to take over and break in in programming on all of the country's TV channels and radio stations for his speeches. Chávez' government imposed Globovisión an intimidating $2.1 million fine in 2011 for an innocent coverage about prison riots in Caracas. The CNE is turning a blind eye. Voter Intimidation. Vote secrecy is feared by opposition voters because their perception is that their vote could be linked to their ID because of the use of voting machines linked to thumbprint readers. This perception goes back to the petition that lead to the 2004 recall referendum. The petition was published online by the PSUV representative Luis Tascón and became known as the "Tascon List". The list was later published by the CNE itself. Many people alleged they were fired or suffered discrimination after their names turned up on the list. Preventing a similar act, the opposition destroyed many lists of voters after its 2012 February Primary to choose a presidential candidate, flouting a Supreme Court ruling that the lists should be turned over to the electoral council. There are also more than 1 million Venezuelans who have given their thumbprints when they applied for public housing. Control of the Electoral Institute CNE. Four of the council's five members are Chavez allies or widely perceived as favoring the president. Vicente Diaz, the one council member often openly critical of the government, said in an interview that a candidate such as Capriles is essentially running "against the state." Intimidation of the Opposition. Chávez is discrediting and demonizing Capriles by using violent rhetoric. 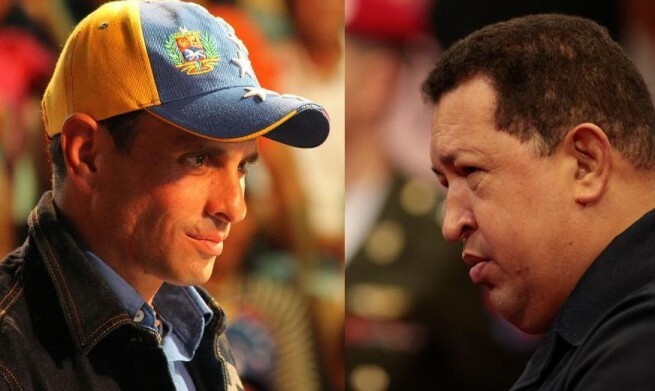 Chavez has recently said his rival has a hidden agenda to impose right-wing measures “that would lead Venezuela to a civil war.” Chávez has emphatically declared on numerous occasions that Capriles is a “filthy pig, the masked oligarchy, bourgeoisie, a liar and worthless”. Chávez claimed to have evidence showing that Capriles belonged to a “fascist” organization of wealthy families implicated in “neo-Nazism" and he portrayed Capriles as Jewish, as a fascist and a homosexual. This atmosphere has created Chavista mobs and thugs that have intimidated the opposition on numerous occasions and that will probably cause trouble on election day. After the continuing demonizing of Globovisión by Chávez, Chavista mobs began also intimidating the TV station, which leaders had to flee the country. International Observers. Unasur is the only invited foreign observer. The mission from Unasur (Union of South American Nations) will be acting as ‘accompanying observer’. OAS and the European Union which sent observers back in 2006 were not invited on this occasion. The figure of international “accompanying observer” is limited to making recommendations on the elections. The US Carter Center declined the invitation. It stated: "The concept of accompaniment differs from observation in that the purpose of accompaniment is to invite foreign individuals to witness the day of the election with a largely symbolic political presence, while the purpose of observation is to invite international organizations to comprehensively assess an electoral process to enhance the integrity of the voting process, contribute to voter confidence, and inform the international community and domestic stakeholders." Commissioning of Polls. In a corrupt country like Venezuela, it shouldn't be too difficult to commission polls in one's favor. 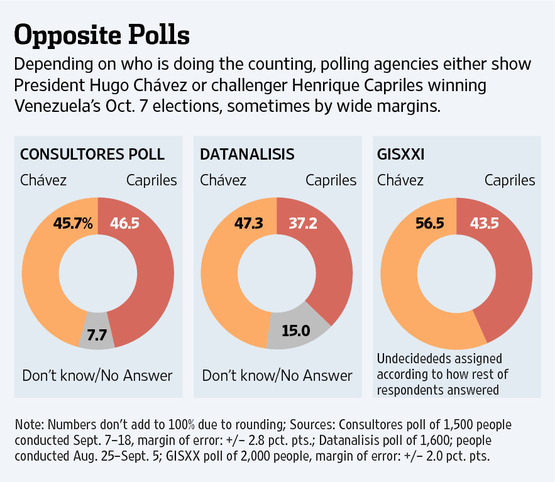 Polling firms like GIS XXI and Datanalisis are widely seen as biased toward Chávez, an impression reinforced by their lack of disclosure on funding sources. 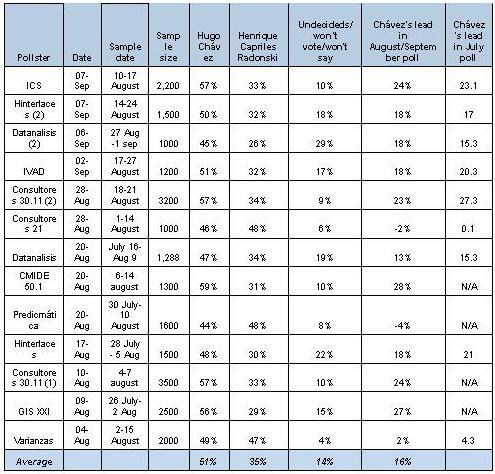 The polling gap between pollsters in Venezuela remains large. It was done in favor of Ortega and probably conducted by Venezuelan advisers, in the 2011 Presidential elections of Nicaragua too. If conducted well and in coordination with the campaign, commissioning polls could influence voters in a massive way. It's the "bandwagon effect" that undecided voters are susceptible to and dependent of their share in the week before elections the effect could be well over 10%. Any Backup Plans to Rig the Election Results? 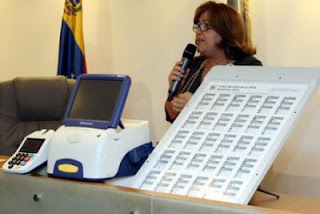 Smartmatic, the manufacturer of the voting machines is a successful 600 employee multinational private company, founded by the Venezuelan Antonio Mugica and with its headquarters in London, UK. Smartmatic was born in 2000 in Venezuela and 4 Venezuelans can still be found in the board. Some key investors of the company are Venezuelans, however it looks like the company is trying hard to distance itself from Venezuela and Hugo Chávez. The company's ownership and consolidation structure seems complicated. The manipulating of the software of the Smartmatic SAES voting machines is very difficult to do, but not impossible. However it is next to impossible to manipulate the software of a significant number of voting machines in such a way that the electoral data produced will surpass electoral procedures and statistical testing. On the day of voting, the electronic voting machines are activated only when the thumbprint that corresponds to the voter’s ID number in the database is registered. The paper ballot receipt that the voting machine produces after each vote, is deposited in a sealed cardboard ballot receipt box by the voter for manual control of the machine produced total tally sheet at the end of the day. The ballot receipts of 54% of all voting stations are manually controlled as well. Once all of the votes are cast, the machine prints the total tally, with enough copies for all of the witnesses at each “Mesa”. After this printing has taken place and only after, the machine is connected to the telephone line and the results transmitted to the CNE. At the CNE, all political parties have representation in the totaling room. If the voting machines are tampered with, it will be revealed by the manual control. However it is important that Capriles provides observers in every voting station to prevent sabotaging the procedures. Capriles won the Governor elections of the state of Miranda in 2008 by closely observing all voting stations and Capriles is determined to guard all 14,055 voting stations closely again all day by the assistance of 133,000 volunteers. Also, the lists of persons in charge of the polling stations, according to the law, are appointed by public draw for the National Electoral Board. Tampering with the electoral registry became very difficult too. According to Comando Venezuela the registry contains roughly 18,000 (1/1000 of the electorate) diseased persons, which is very little. Using these voter ID's fraudulently is difficult because of the required thumbprint and because the voter’s finger is marked with indelible ink after voting. Election ink typically contains a pigment for instant recognition, and silver nitrate which stains the skin on exposure to ultraviolet light, leaving a mark that is impossible to wash off and is only removed as external skin cells are replaced. Election ink typically stays on skin for 72–96 hours, lasting 2 to 4 weeks on the fingernail and cuticle area. "¡Un Hombre, Un Voto!" is one of CNE's slogans. As explained above there is little opportunity for Chávez to rig the election results itself. The most probable thing Chávez would do if he foresees his defeat, is trying to buy time by postponing election day or nullify the elections because of orchestrated violence or some made-up reason like fraudulent elections (!). This will give him time to campaign more intensively and as an added benefit Capriles needs to find more and new campaign funds on a very short notice. ballots and the the voter information system (SIE).